From an era where the buddy movie became a ubiquitous fixture comes the one film which firmly stood out from the rest. The first film to showcase a looser, comedic turn from Robert De Niro (and considerably more grounded than his Meet The Parents shtick), Marin Brest’s Midnight Run (1988) provided the best use of profanity as poetry until Malcolm Tucker turned up on the big screen decades later. Celebrating its 27th anniversary this year (the film was released at a time when co-star Charles Grodin was still considered hot box office property) this digital spruce-up offers a welcome return for a film which has lost none of its potty-mouthed charm. De Niro’s ex-cop turned bounty hunter Jack Walsh is a man who will do anything to deliver his target. His juiciest score yet comes in the form of crooked accountant Jonathan Mardukas (aka The Duke) who has been caught skimming off the mob and has skipped bail. 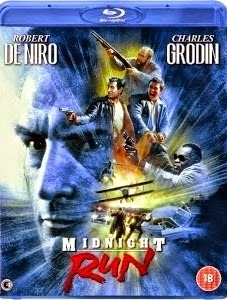 Initially believing his job to be a midnight run (industry slang for easy delivery) Walsh’s work is cut out by a horde of FBI on his tale, a belligerent competitor (John Ashton) who has also been employed the same scheming bondsman (Joe Pantoliano) as well as the boss who has been embezzled (Dennis Farina). Gaining a fair amount of infamy for its excessive cursing, Midnight Run is now considerably tamer than anything produced in the contemporary Hollywood landscape, but it remains a hugely entertaining and good-natured romp. Brest also manages to sneak in some unexpected moments of pathos and ends with a scene of earned bromance which undoubtedly had some of its male audience close to welling up in the cinema. But none of this would work without a strong relationship between the two leads, and the great odd couple chemistry De Niro and Grodin have is paramount to the film’s success. De Niro channels his intensity to devastating comedic effects and Grodin brings a subtly and shading to a part which could have very easily have been overplayed and too broad to register. The sublime casting extends to seasoned character actors and 80s fixtures like Farina and Pantoliano, but it’s the superb weasely turn by the woefully under-utilised Ashton (re-teaming here with his Beverly Hills Cop director Martin Brest) which really compliments the two leads. Add to that a fun bluesy Danny Elfman score and you have an action caper which is amongst the very best in the genre and is screaming out to be discovered and treasured by a younger generation.